Your garden shouldn’t look unkempt while there are a bunch of budget hedge trimmers you can buy from various stores. The best hedge trimmer you need for your garden is what we are about to show you in this article. Also, a detailed/extensive buyers’ guide is equally available to guide our reader who wish to buy this gardening tool. Well, some people make use of quite a lot of other gardening power tools to tidy up their gardens. Nevertheless, there is a specific tool for trimming, pruning or cutting unfrequented shrubs/bushes – a hedge trimmer. Also, this power/machine tool can be called bush trimmer or a shrub trimmer; so, when you hear such names, they are still referring to this tool. In today’s article, we will be reviewing quite some units of this gardening tool. However, this is not just a sole gardening tool; it is a machine tool and as such can be used for other purposes outside a garden. The main function of this trimmer is to cut down shrubs which tend to make our gardens appear unappealing. Note: a hedge trimmer is not to be engaged when trying to cut through a tree trunk; it is not so powerful for such actions. Instead, a tough saw is what you need to handle tree/branches cutting action. In order not to bit so much around the bush, let’s get straight to the purpose of this article which is reviews the best hedge trimmers for use in 2019. Having a trimmer with a 22-inch blade length and a reliable 20V motor is something an ardent gardener would probably not wish less for. Just the name – Dewalt gives you some sort of confidence that you’re buying the best power tool amongst many other units. Well, the Dewalt DCHT820P1 hedge trimmer is indeed a great battery-powered machine tool to buy. The tool is very light to handle, also, it has an ergonomic handle area. So, every aspect of handling this tool is just painless and stress-free. Powerful motor: A reliable, patented 20V motor powers the Dewalt DCHT820P1 machine to work; the best in class. 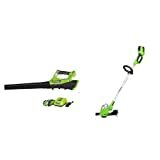 Lightweight design: This cordless hedge trimmer is almost lighter than the other units listed on this post. Sturdy design: Dewalt always manufacture power tools with the best-in-class designs, this model is no exception. Longer blade, wider capacity: Comes with a longer blade with 3/4″ cutting capacity/space. More runtime: The 5Ah battery available on this machine runs for a very long time before it gets low and needs to be recharged. One of the features I love about this tool is yellow and black color blend; the mixture is so perfect and so much made the tool more attractive than many other hedge trimmers you will see in the market. The 20V motor on this tool is what I didn’t find to worth emphasizing more about. This is because for an expensive trimmer it should have included a higher voltage motor. 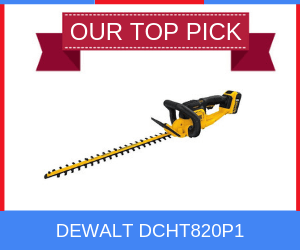 What makes Dewalt DCHT820P1 the best cordless hedge trimmer 2019? It comes with reliable components and a vivid blade that cuts through all shrubs in the garden. Also, it is a sturdy trimmer with a strong battery. You will equally get to any side of the garden easily due to its cordless state. This is the best machine for handling tough hedges and shrubs. It is nicknamed the POWERCUT Hedge Trimmer. There is a 20V motor available on this power tool and the battery is capable of trimming up to 3,000 sq. ft. in a single charge. Also, the ergonomic hand grips and low vibration mechanism helps to maintain your optimal comfort while using the tool. 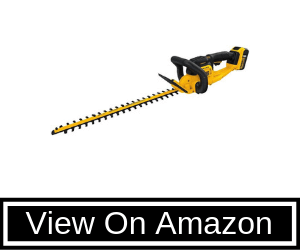 Furthermore, just as the Dewalt trimmer above, this machine comes with a 22-inch cutting blade with ¾-inch space in-between for cutting shrubs effectively. BLACK+DECKER LHT321FF is sold at a very considerably budget price, hence, it is arguably the best cheap cordless hedge trimmer you can buy. Long lasting battery: In one charge the battery on this machine powers it to trim up to 3,000 sq. ft. Comfortable grip: You’ll be comfortable all the while you held on to this trimmer and working with it, thanks to the ergonomic handle. Lightweight design: Since you may be working with this tool for a very long time, it is made to be extremely light on the hand. The PowerCut hedge trimmer is a great gardening machine which does not have any sort of limitation. Pleasingly, the performance of BLACK+DECKER LHT321FF was stunning; considering it has a 20V motor, it delivered a great job. Also, the less vibration mechanism is effective and makes the tool much easier, seamless to use than the others. At a price below 100 bucks, this professional hedge trimmer is one of the best for everyone who fancies a neat/appealing garden. Furthermore, other users of this power tool testify that is indeed an awesome trimmer to own. Initially, that was what boosted my eagerness to try out the tool. So, after handling the tool, I discovered that the customer reviews on Amazon were neutral. Nothing gladdens the heart more than when you’ve got a flexible utility tool which you could take along with you while on the go. The Worx WG255.1 hedge trimmer is a portable, lightweight power tool which provides versatile flexibility. 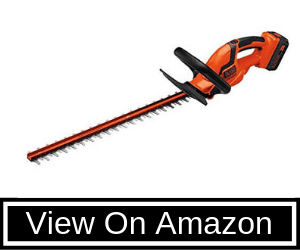 It is one of the best hedge trimmers you can get at this moment. This is a unique trimmer; it comes with a dual-action cutting blade which delivers fast clean cuts with less vibration. Also, the handle area is sleekly designed in a slant D-shape manner offering an ergonomic grip of the tool by a user. Also, the features of this tool are a bit different from the usual, but, the design is still like a typical hedge trimmer would look. Flexible battery: You can use the battery on any 20V Worx tool to power this tool and it will run efficiently. In other words, the battery is not dedicated. Dual-action blades: The 20-inch blade on this model delivers dual-action to ensure an effective trimming action. Overmold soft grip handle: You will love the handle of this tool; it is extremely soft, geared to reduce vibrations. Lightweight: Yeah, this hedge trimmer is very light to carry about. Thus, you’ll achieve more. With the aide of the dual-action blades, it was easier to trim down the shrubs in the garden; as you move front and back, the blades deliver excellent trimming than the blades on other hedge trimmers. This tool will make you love to trim your garden always due to its lenient body build plus the ergonomic handles. The overall performance of Worx WG255.1 hedge trimmer is far better than its counterparts sold at the same or similar price. It is sold at a low-cost price and the 20-inch blade is still long enough to achieve what you want in less work time. Actually, this is supposed to be the top pick based on its features, but, the Dewalt DCHT820P1 score above this on performance. 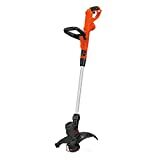 Yes, it is still cheaper than Dewalt DCHT820P1, packed with a longer blade, plus a whopping 40V motor, still, this is the most suitable place to place this hedge trimmer on this list. 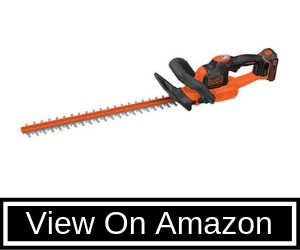 BLACK+DECKER LHT2436 is the best heavy-duty hedge trimmer you can get at a price below $125. It is a professional power tool for gardeners and homeowners alike. As expected, this is a cordless hedge trimmer with a sleekly, blended design. So, it stands outs in the BLACK+DECKER family as regards to hedge trimmers. Dual-action blades: Also, the 24 inches blade attached to this tool delivers dual-action with great precision. Comfy front handle: The front handle is fully wrapped with a soft rubber material for the user’s optimal comfort. Fast charging battery: Although the battery lasts over hours once fully charge, it takes only about 1hr for the battery of this tool to charge completely. The 24-inch cordless LHT2436 dual-action blade delivers more accuracy with the help of the powerful 40V motor; works will be completed faster using this machine. Also, Black + Decker LHT2436 can actually cut through branches up to 3/4-inch thick. 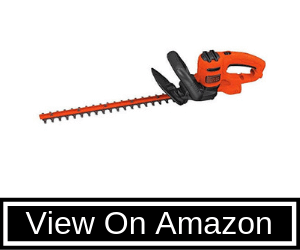 What are the boosting capabilities of this hedge trimmer? It packs the highest motor which is 100% efficient and effective for trimming actions. Equally, it comes with a lengthy blade with about ¾-inch space between the nodes so as to contain and cut down thick branches perfectly. However, while the visible features of this power tool are so palatable; the overall performance is quite unpleasant. 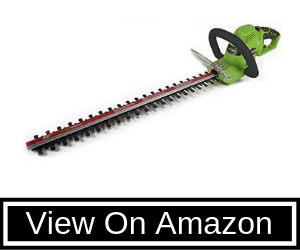 It could have been our top pick for the best hedge trimmers 2019, but, a lot of users pour out their dissatisfaction as regards to this tool. While I have not used it for so long (like for some months), there are many complains from other users that the tool does not last over a long period of use. From my end anyway, the tool somehow jams more often than expected while in the field. Hence, this is not our best choice, but it is still a good heavy duty hedge trimmer to check out for. Inexpensive, yet very helpful for the purpose. 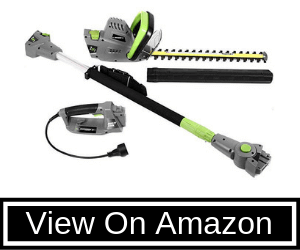 The Greenworks HT04B00 Corded hedge trimmer is the best, corded hedge trimmer 2019; coming with a 22-inch blade length and a 4 AMP motor, it delivers an almost unmatchable work result. Because this is a corded hedge trimmer, the manufacturer has included a convenient cord lock system to prevent accidental unplugging when you’re working with the machine on a garden. Greenworks HT04B00 flaunts a sleek design with a 5/8-inch cutting capacity for controlled, easy trimming of most bushes and hedges. 50-foot long cord: The wire/cord that supplies power to this tool is about 50-ft long; this is very long indeed. Dual-action blade: In other not to fall out of fashion, this hedge trimmer comes with a 5/8-inch cutting capacity, dual-action blade. 4 AMP Motor: This motor powers the Greenworks HT04B00 to function efficiently. Unique premium design: It looks very attractive in its stunning green/black blended finish. Outstanding handle mechanism: Comes with an innovative rotating rear handle for swift trimming at angles. Although this is corded-electric hedge trimmer, it allows you to reach out to far places while working, thanks to the 50ft cord length. Also, this tool includes a convenient cord lock system to prevent the cord from getting off the socket when you’ve utilized its full length. What does it feel like to trim with this tool? Just like the others, the handle/grip is mechanized to minimize vibration, so, you’ll remain comfortable holding on to this tool all the while you work. Also, the lengthy cord makes you feel like you’re using a cordless hedge trimmer as you’ll be able to reach out to far places before moving the power supply system. Furthermore, irrespective of the corded nature of this tool, the blade is very efficient and has more cutting capacity (5/8-inch). Trimming with a tool powered by a task-hungry 56V motor is something you should wish for. Since the price is not very expensive (still below $100), maybe this is what you need to tidy up your garden. 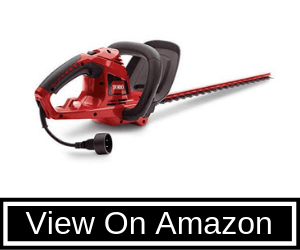 Not only does this machine come with the best-in-class motor, but it also features an unmatchable premium body build; it is certainly one of the best hedge trimmers for everyone in need of one. The blade of this trimmer is very though; it can cut through any shrub or 3/4 inches branches perfectly. Also, it is compatible with all EGO POWER+ Arc Lithium-Ion batteries. Just the design of this tool alone leaves a great first impression on anyone that sights it on a store. 56-Volt Lithium-ion battery: A whopping 54V “High-Efficiency” motor powers this tool to work. Task hungry blade: The 24 inches blade on this hedge trimmer is ever ready to work and it delivers perfect cuts even at angles. Weather-resistant build: This machine is geared to stand all weather conditions. Lightweight: Looking at it for the first time, it looks a bit heavy. However, when you lay hands on it, you’ll find out it is extremely light. E-brake system: An electronic brake system is included in this hedge trimmer for total control of the user over the blade actions. The attractive design is something you’ll not want to stop talking about in haste. Also, the blade is a dual action blade, but it doesn’t actually look like a typical dual-action blade. Thus, I say that this hedge trimmer is just unique being that every part of it is patented. What do I like about the EGO Power+ hedge trimmer? It comes with an electronic brake system which halts the blade at any time you engage the button. Also, its accessories are completely compatible with all other EGO power tools. This means that you can use any of its parts for other EGO power tools (if you have). This is like a 2-in-one power tool; a pole trimmer and a hedge trimmer. Won’t you like to try out a convertible hedge trimmer? Here is the best handheld hedge trimmer on this list – Earthwise CVPH43018. It is a stunning, classical hedge trimmer which is also flexible. This model includes a protective blade cover and a shoulder support strap. A pole hedge trimmer is much versatile than any other type of hedge trimmer; it is the best power tool for trimming high flowers in a garden. Interestingly, this unit reaches up to 13ft higher than the user’s height. Earthwise CVPH43018 is the safest, simple and easy-to-use shrub trimmer for dealing with tall hedges, shear shrubs, and solitary bushes that are just out of reach. Convertible power tool: If you’re not doing high trimming, you can easily transform this tool into a typical handheld hedge trimmer (so it looks like the other units above). 4.5 AMP motor: The motor that powers Earthwise CVPH43018is efficient and task-hungry. Flexible components: All the components of this hedge trimmer is easy to detach and reattach. Protective blade cover: Use this cover to protect your tool’s blade when not in use; this will also cause the blade to last longer. This is apparently the best power hedge trimmer for handling shrubs or bushes that are just out of your reach. What’s so special about a pole hedge trimmer? They are usually flexible and appear more useful than just normal hedge trimmers. This is because they can be used to trim high hedges perfectly. This model from Earthwise is very much flexible; it is a convertible pole hedge trimmer with endless capabilities. It comes with an 18-inch blade which is considered quite short for professional trimming tasks. Also, the cord is not very long enough. 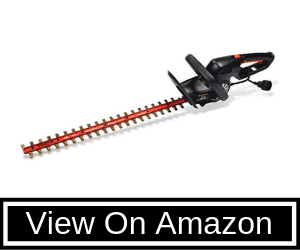 An unusual power-efficient motor powers this hedge trimmer to function flawlessly. Also, the cutting-edge dual-action blade is featured by this power tool. While you’ve seen quite a lot of good hedge trimmers for use in 2019 or later years in this article, there are more you need to know about. The Remington RM5124TH trimmer has a lightweight design and features an ergonomic cushioned grip that lets you cut through even the toughest branches with comfort and ease. Rotating handle: It features a 180-degree rotating handle in order to increase precision & versatility. Reliable motor: The 5 AMP motor is 100% reliable for obtaining distinctive trimming results. Unique blade: This power tool comes with a titanium coated blade for maximum durability and efficiency. Cushioned grip: Your hands will feel comfortable all through the while you make of this hedge trimmer. The blade on this trimmer remains very sharp even over long use and offers smoother cuts with reduced vibration. Its swivel nature makes it the perfect ideal for shaping the peaks of taller hedges or grooming the areas at the base of a hedge. Also, the blade is very long (up to 24 inches in length); it moves in two directions (dual-action) to deliver cleaner cuts through branches up to 3/4 inches thick. Best hedge trimmer for homeowners or gardeners on a budget. The Toro 51490 comes with a sleek design that will attract anyone that sets their eye on it. It also looks very premium to the extent that you may start a debate on the cheap price. This is a corded hedge trimmer anyway; it requires a standby power supply source for it to function as you wish. However, it packs a great motor than ensures of steady and unrelenting power flow through the tool. 22-inch-long cutting bar: Designed with a hardened steel material, the blade on this power can cut through the toughest 9/16 inches branches, shrubs, and bushes. Mechanized handle: Comes with an ergonomic grip geared to minimize vibration and improve efficiency. Cord lock feature: There is a handy cord lock system that prevents disruptive disconnects. Due to the handy cord lock system, Toro 51490 will never disconnect from a power source accidentally. Why do I love this hedge trimmer? Apparently, it is the only hedge trimmer on this list that is capable of dealing with shrubs, bushes, or hedges up to 9/16 inches thick – the hardened steel blade is best in class. Also, the 4 AMP motor does a good job, coupled with the strong blade, your garden will never look untidy when you have this tool. The last but not the least. Here’s another powerful trimmer from Black + Decker. Already, there are two cordless hedge trimmers from Black + Decker featured on this list, now, let’s see how a corded Black + Decker hedge trimmer performs. 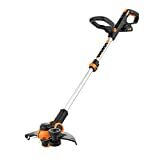 This is obviously the lightest trimmer on this list; weighing around 5.1 lbs. The BLACK+DECKER BEHT200 is a super-compact hedge trimmer with tough components and can cut through shrubs or hedges up to 3/4 inches thick. It features a not-so-long but task-efficient steel blade. Below are some of its major features worthy to be mentioned. Premium blade design: The 18-inch blade flaunts a stylish design which is much acceptable. Lightweight design: BLACK+DECKER BEHT200 looks sturdy, yet it is very light to carry on for hours. A 3.5 AMP motor may not seem to deliver the best results, but, the motor on this trimmer tends to be quite effective. Also, you’ll almost not feel any vibration why working out there in the field; the grips are fully wrapped with a rubberized material for maximum comfort of the user. 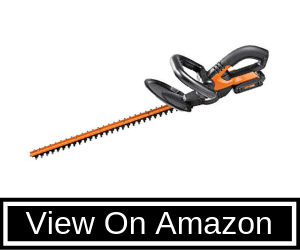 So, do I love and recommend this hedge trimmer? With all my heart, I do recommend the BLACK+DECKER BEHT200; not only does it prove to be reliable but, it comes from a reputable power tools manufacturer – BLACK + DECKER. Furthermore, this model is highly compatible; it won’t require a lot of space for its storage. Also, the power cord is up to 100ft long; you’ll definitely reach out to far places with this tool. Obviously, there are certain things of perhaps features to keep in mind when looking for a good hedge trimmer to buy. There are a lot of units out there in the market from different manufacturers. Hence, you need to be guided through the process of selecting the best hedge trimmer from the crowd. This buyer’s guide is for people who are not familiar with the buying process of a hedge trimmer. Most times, the brand name technique doesn’t work; if you’re going to choose your next hedge trimmer based on the manufacturing brand, you may be disappointed at the end. Hopefully, this guide will be of great help for everyone who’s going to buy a new trimmer for use. Already, the units reviewed in this article are tested and trusted; you can go for any of them. So, are you buying the hedge trimmer to use it occasionally for your home garden or for professional use as a gardener? This will determine the type, specs, and features you should be keen to see on your next hedge trimmer. Generally, a corded-electric hedge trimmer is not considered the best for a professional user. Instead, a cordless unit will be a great deal. This is to allow the professional much allowance and flexibility of movement while out in the field. There are majorly two types of hedge trimmers, which includes; corded-electric and cordless units. Albeit, there is also pole hedge trimmers; it is not really a standalone hedge trimmer type. Also, you need to consider how big the field of application is. You will have to constantly drag a flexible power unit along with you while using a corded-electric hedge trimmer because of the cord limit. On the other hand, a cordless hedge trimmer won’t require a flexible power source; however, how much cutting/trimming you’ll achieve lies on the battery capacity. Hence, you need a unit with a strong/long-lasting battery as a professional user. So, the size of the field where you’ll use the hedge trimmer is one of the essential things to keep in mind when buying a new unit. Based on personal preferences, the choice between a corded or a cordless hedge trimmer will definitely differ from person to person. However, if you’re looking for cheaper hedge trimmers, then, you search/choice is limited to corded-electric units as they are the cheaper models you can buy. Also, these models are lighter as they do not include heavy duty batteries. On the other hand, cordless hedge trimmers can be very expensive and slightly heavy because they operate with heavy-duty batteries. These models somehow look sturdier in terms of appearance/build. 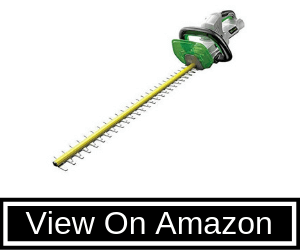 3.1 Go for pole hedge trimmer if you trim high hedges that are just out of reach? If you occasionally need to work on hedges that are just very high, out of your reach, then, you should consider a flexible pole hedge trimmer just like the Earthwise CVPH43018 on this list. With a pole hedge trimmer like the Earthwise CVPH43018, you’ll be able to reach out and trim high hedges up to 8ft above your height. Also, some models are convertible, so you can easily detach the pole and use them as a typical hedge trimmer; in other words, you are getting a 2-in-one hedge trimming machine if you go for a pole hedge trimmer. Interestingly, these pole hedge trimmers are not quite expensive; even, they are cheaper than some native cordless units. This is very simple to decide; corded-electric hedge trimmers are obviously lighter in weight. Nevertheless, this doesn’t mean that the cordless units are really heavy per se. Due to the batteries attached to the cordless units, they tend to be heavier. 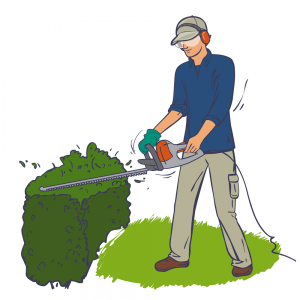 The average weight of cordless hedge trimmers is around 10 lbs (some weigh far below than this – 6.5 lbs). The average weight of corded-electric hedge trimmers is around 6.5 lbs. Irrespective of being a corded-electric or cordless hedge trimmer, the main purpose of this machine tool is to help in trimming/shaving down the outgrowing hedges, shrubs, and bushes in our garden. In this article are the 10 best picks from us at TechDrinking. They are ultimately reliable for trimming thick hedges. All the models listed out here were tested by us; so, you can confidently pick your next best hedge trimmer from this list.